With a range of executive, chauffeur driven cars suitable for all your business and luxurious travel needs, Platinum Executive Cars offers a refined and professional executive car hire and chauffeur service for all our clients in the Sutton Coldfield, Birmingham and West Midlands area. We will quote all your executive transfer requirements to and from any part of the country. No area is out of our remit as we undertake many transfers outside of West Midlands area. Our Mercedes S Class will suit up to four passengers who require that extra style and comfort from their chauffeur driven car hire. This chauffeur driven saloon will suit anyone who requires a top of the range luxury vehicle be it for business travel, airport transfers,sporting events or just that special evening out. Our Mercedes saloons will suit up to four passengers who require smart yet functional luxury car hire. This chauffeur driven luxury car best suits business executives, middle management or individuals who require chauffeur driven business travel, airport transfers or just that special event or evening out. Why have a Limousine when you can hire our luxury Mercedes carrying up to six passengers who require a prestigious, functional and comfortable vehicle, the Viano V-Class offers space and flexible seating arrangements with complete leather interior enjoying that extra headroom. The luxury Mercedes Mini Bus best suits airport transfers or perhaps a long distance touring party or business people on route to meetings or road shows who would like to continue working whilst on the move in chauffeur driven luxury. For a party of up to eight passengers, who require a functional and comfortable car hire - the VW Transporter offers acres of passenger and luggage space, as well as flexible seating arrangements. 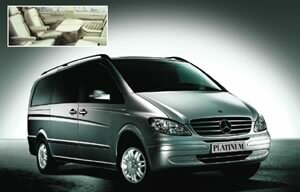 This executive MPV best suits long distance touring parties, airport transfers and sea cruise transfers.